Ever heard of the game Energyville? It’s an online game where you name a town, and then, Sims’ style, decide how you’re going to power it using the available technologies. Each has their own pros and cons, and costs different amounts of money, environmental damage and national security. Then the game takes you through the years, showing you how the choices you make affect the city. On the surface, it sounds like a good concept. But play it once or twice, and you might start to wonder just why it is that biofuels always “get more expensive due to lack of corn supplies” in every scenario presented, though petroleum, natural gas, and shale oil seem to get better with age. 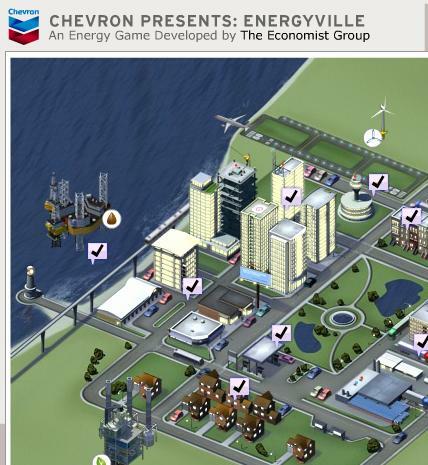 Or how even if you have your town fully powered with alternative energy, the game won’t let you advance to the next level without adding some petrol to the mix. I played the game several times, and Beautopia never lived up to its name, no matter how valiantly I erected wind towers and solar panel racks. Well, it did LOOK pretty, but my score couldn’t compete with the oil guzzlers and nuclear supporters out there. In a greater sense, this game underlines what seems true in most of life. Most things seem okay on the surface, pretty kind and helpful even, but a little digging (not much in this case) reveals that “free” offers contain strings, “impartial” observers are paid for their opinions, and even organizations set up to help others usually have their own agendas that can affect their actual aid. Green living is a noble goal, and of course I encourage you to follow the natural path. Just be aware of the greenwash, as they call it, because for every understanding and caring soul who enters the green “industry”, there also enters a conglomerate like Safeway or KMart, hoping to make a buck. Learning to take only what you need from these giants is a lifelong game in and of itself.